9/12/2003 News media contact: Tim Tanton · (615) 742-5470 · Nashville, Tenn. NOTE: A sidebar (UMNS story #439), a UMTV report, photographs and audio clips are available. The Rev. Al Rhodes-Wickett plays the piano at his home in Los Angeles. 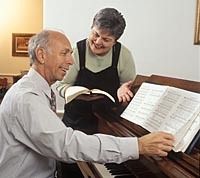 He was an effective pastor and a gifted musician before contracting Alzheimer's disease, according to his wife, Sharon. The United Methodist clergy couple is learning to deal with the disease, which struck when Al was in his late 40s. A UMNS photo by Tom Keller. Like a computer virus, Alzheimer's disease has invaded the home of a California clergy couple, Al and Sharon Rhodes-Wickett, and turned their lives upside down. The comparison to a computer virus ends, however with the realization that this disease that slowly steals memory cannot be stopped. The ordeal for the United Methodist family began when Al was in his late 40s. He had trouble completing tasks and became unusually forgetful. One day, he forgot to pick up his young son, Ben, from school. When Sharon was asked to serve as superintendent of the Long Beach District in 1990, Al took leave from active ministry to be home with Ben and daughter Rachel. Sharon served as a district superintendent for four years and is senior pastor of Westwood United Methodist church in Los Angeles. Al's condition worsened. After months of observation and tests, the diagnosis finally came: Alzheimer's. Like many people, Sharon had thought of Alzheimer's as a disease that strikes the elderly. All of us know of Ronald Reagan and have seen the blank stares of frail individuals who populate nursing homes. Here Sharon and Al were, in the prime of their ministry, with two young children. "I had that sinking feeling that so many people have when a disaster or a train wreck happens," Sharon recalls. "I just felt swallowed up â€¦ my gosh, now what?" However, she wasn't surprised by the final diagnosis, since Al's father had also suffered from the disease. "'This is it,' I thought. 'This is what we are going to have to live with.'" Al was an effective pastor and a gifted musician who used his brain a lot, according to Sharon. "He bought a computer long before they were commonplace and began writing programs that were more suited to what he wanted to do. Right now he can barely figure out how to go online or switch the printer from color to black ink. It just breaks my heart because he's really a smart person." The husband and father they once knew is disappearing. Sharon sees the disease as death by a "thousand subtractions." In an interview with UMTV, Al describes the joy of being a pastor and the pain of going on disability leave. "That was kind of tough because I knew something was wrong, but then all of a sudden, bam, I'm out." He describes the disease as "microscopic little persons that like to eat the memory (and) consider the newest memories to be the tastiest ones of all." In addition to medication, he said he has fought the onslaught of the "little persons" with three W's: walking, writing and wishing. As a pastor of a 600-member congregation, a wife and a mother, Sharon finds herself in the dual role of caregiver and care receiver. She is trained to care for others, a role she loves. But she admits that receiving care, such as a weekly dinner for the family prepared by women in the church, is difficult. "I feel like, well, I'm capable. I shouldn't have to take help. I shouldn't have to receive this. "I really can't imagine going through this without being grounded in God's presence," she says. "I know that God gives us the strength and capacity to take the next step. I know that my future is different than I thought it was going to be, but whatever it is, God's in it." For her, being part of a faith community is critically important. "So many people tell me they pray for us all the time, and I know they do. It is very sustaining to know there's that kind of support." Looking for a support group was almost impossible. "People can't believe that someone Al's age has Alzheimer's," Sharon says. "When I went looking for a support group, I was pretty much told that either you can have a support group with people your age who are dealing with their parents or you can join a spouse's group where everybody would be the age of your parents. "I wanted a support group for people like me - younger, still working, with children." She finally found such a group, the only one of its kind in Los Angeles County. "It is new and experimental," she says. "We're writing the book." Al is 58, Sharon, 54. Ben, 17, is a high school senior, and Rachel, 21, attends Scripps College in Claremont, Calif.
Because her dad was so young when the disease emerged, Rachel says she has had few places to turn for support. "I'm so glad I have my brother. He's the only person I know my age that knows someone that has a dad with Alzheimer's disease." Although no one tracks early onset cases, the Alzheimer's Association estimates that as many as 10 percent of Alzheimer's patients, or 400,000 of the 4 million people diagnosed each year, are younger than 65. An unknown percentage of that group is still caring for children. Shin Yi Wu, a health researcher with the Rand Corp., a Santa Monica Think Tank, told the Los Angeles Times that if trends continue, more than 513,000 American men and women between 45 and 64 might be affected by the disease by the beginning of the next decade. Sharon expresses amazement at how the children are coping. "What they're facing with their dad is really tough, and they don't have the experience and the resources that come from being batted around in life. I think there has been a drawing together for us, all four of us, to figure out how do we get through this." Ben ticks off the accomplishments of a father who was a university math major, musician, licensed pilot, and teacher in Africa, where he learned the Shona language. "He's the most amazing musician I think I've ever met in my entire life," Ben says. "He's written three musicals and is working on a fourth. He plays banjo, guitar, piano. He sings. He does everything." Watching his father's musical skills disappear has been painful. "He plays (the piano) every day, but he seems to get worse." Because of the disease, Ben says he has matured fast and appreciates things more. Rachel agrees. "I credit some of our family's closeness to this disease, partly out of necessity and survival, but partly out of a genuine care and concern for each other." Sharon and the children like to accent the accomplishments and good memories of their husband and father. "It truly is an unjust disease," Rachel says. "In my father's case, he's lucky because he lived an amazing life. He did more than most people do in their entire lives by the time he was 50. It is comforting to know that he really did complete a lot of things he wished to complete before the disease began to hit him hard." *McAnally is a former director of United Methodist News Service.